It doesn’t matter if you need your piano just moved from one room to another, or to a different house, or a different state, Action Piano Moving is extremely well equipped to do any of those things for you at a very affordable price. We are piano moving professionals who deal solely in moving pianos, not furniture. It makes a HUGE difference! So feel comfortable in knowing that you can always expect nothing but the best from us. Do not try moving a piano on your own! You will risk damaging the piano, your home or you may even hurt yourself. Leave the entire moving job to the professionals. We move pianos in and out of homes, as well as concert halls such as Juliard, Radio City, the NJ Performing Arts Center, Kimmel Center, and many other top music halls. Action Piano Moving will help you move your piano from one room to another or way across the country. You’ll never have to go through the bother of trying to figure out how to move your piano over a long distance. 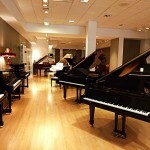 We work with all name brand pianos such as Steinway, Baldwin and Yamaha. We also do work for many piano dealers, refinishers, and rebuilders in the states of NY, NJ, CT, MA, RI, PA, MD, and VA.
We’ve Been in Business For 20 Years! We’ve Been Moving Pianos For 30 Years! We’ve Moved Over 40,000 Pianos! This means you can trust us to move your piano safely and with care. It doesn’t matter if it’s a concert grand piano or just a small upright, we are the piano moving company for you.